I finally finish by canister of NOX CG3, and I'm actually glad that I'm done with it. I have to say that this is a first for me - in terms of being glad to be done and over with a supplement. Well, I guess there is one other unforgettable exception a few years back, which was by far worse - the Pinnacle Juiced Protein fiasco I went through. While my experience with NOX CG3 isn't all bad, it wasn't up to par comparing to other similar supplements I've used in the past. I've used plenty of creatine and NO matrix supplements such as BSN NO-Xplode, San V12, and Universal Animal Pump, just to name a few - some of them several times over - but for the Xyience NOX CG3 that I've just finished, I have to admit that I was rather disappointed with my experience with it, and will probably not be using it again. I've used some Xyience supplements before, such as their Xyience Xenergy energy drink, which worked out okay for me. While I didn't expect anything thing exceptional from NOX CG3, I was expecting a better overall effect than what I had experienced. If you have used this supplement, please share your review of Xyience NOX CG3 here. In the popular creatine and NO matrix supplements category, there are no shortage of products. Most are rather similar with similar ingredients and you'd expect similar results with these products. Out of the many creatine / NO matrix supplements, there are a few standouts, and then there are a few that aren't quite up to par. Obviously, please keep in mind that this is simply my personal opinion based on my experience using these different supplements. So, even though I can't find much positive to say about NOX CG3, you might actually have much better luck than I did with it. 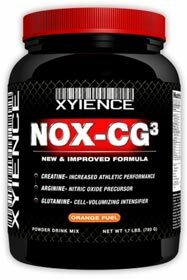 The key ingredients in NOX CG3 are the creatine complex, which contains several different forms of creatine, AAKG, Glutamine, and Taurine. The creatine complex contains creatine monohydrate, creatine ethyl ester, creatine alpha ketoglutarate, and tri creatine malate. You've no doubt have used creatine monohydrate, or at least heard about it. Creatine works by increasing the energy of your muscles by increasing the amount of ATP. ATP is the fuel for your muscle contractions. You can read more about creatine monohydrate here. Creatine ethyl ester (CEE), is a much hyped creatine supplement that claims to be more effective than other forms of creatine, among many other unproven claims. We have done some detailed research on CEE, and have found studies  that actually found CEE to have several disadvantages compared to regular creatine monohydrate, debunking some of the claims made by CEE. You can read more about our article on creatine ethyl ester here. Glutamine is one of the most common amino acid found in your muscles - over 61% of skeletal muscle is Glutamine. It gets depleted during intense exercise, and it is needed throughout your body for optimal performance. You can read more about glutamine here. Finally, L-Taurine is a semi-essential amino acid that plays an important role in metabolism. Studies have found taurine to have a role in nitric oxide product, where lowered levels of taurine reduced the nitric oxide production.You can read more about taurine here. If you've read this far, you'll know that I wasn't too thrilled with my experience of using NOX-CG3. While it's not the worst I've tried, it did not seem up to par compared to some of the better creatine / NO matrix supplements I've used in the past. While I've certainly had my fair share of supplements that did not work, NOC-CG3 was in a league of its own - for making me yawn non-stop! Yeah, okay, I admit that this is probably one of those rare things that probably very few people will ever encounter, but for whatever reasons, within minutes of taking my NOX CG3, I would start yawning non-stop. It might sound ridiculous, but I decided to count how many times I would yawn, and stopped counting after about 20 yawns within 12 to 15 minutes, and that's not exaggerating. I decided to test it out to see if it might be other reasons such as not getting a good night's sleep (although I do not recall having a bad night sleep during the time I was taking NOX CG3). There were several days during my cycle of NOX-CG3 where I decided not to take it, and see if I yawned, and it turned out that I did not yawn no-stop on days when I did not take nox-cg3. Once I started back on it, I started yawning again, and there was no way around it. I just don't get it. Anyway, I'm unaware if anyone else have had similar experiences, it would be interesting to know. As always, please share your review of Xyience NOX CG3 here. Non-stop yawning is the biggest complaint I have about NOX CG3. Other than that, some other things I thought needed improvement is their packaging; effectiveness; and product quality. After finishing my canister, I can't really say that I felt much difference between taking it, and not taking it. Unlike other similar products, I did not really notice much of a boost in physical performance. I also found that the powder was rather clumpy in my container. There was plenty of time left until expiry, so I can't say if it got some moisture or it just tends to clump like that. Again, keep in mind that I've only used one container of this stuff, and it could just be that I got some bad luck with it. I won't find out, because I don't plan on using it again, sadly. I think that the powder clumping up might have a little to do with its packaging. I thought the way they decided to package NOX CG3 was just terribad (terribly bad). =) It came in a rather nice looking tin canister, with a plastic lid, and to my surprise, the supplement powder was put inside the canister in a rather crappy zip lock bag! It makes me want to ask whoever did the packaging design: "What the heck were you thinking?!?". I'd much rather have the powder placed in a simple, standard, plastic container that actually sealed tight. While the zip lock bag sealed tight, the lid on the canister is simply a clamp on type that does not seal tight. So basically, I had to open the lid every time, and open the zip lock bag, get 2 scoops, seal the zip lock bag, and put the lid back on. Talk about annoying. It's rather easy to leave a little opening in the zip lock bag, if you didn't double check it after sealing it. Seems to me they put more thought into making the container pretty, rather than functional.